I had high hopes for this season, but they're starting to fall. Anyone else? Also, I much prefer the longer format of the regular PR. An hour and a half is necessary to get any idea of what's going on with people. Best moments: Asha and Alexander working well together made me happy. And Alyssa Milano finally wore something pretty on the runway! Also, I give Mitchell credit for not snapping at Daniel (that we saw). He was driving ME crazy and I was just watching! Worst moments: Well, Sam didn't reign in his ego. Kini made his whole look but he had no qualms taking credit for it. He's starting to lose me as a fan. However, Kini wasn't exactly gracious either. If he had an issue with Sam, he should have told Sam. Not the cameras. He was acting a bit like a martyr. Best garments: This week the winners deserved what they got. Asha and Alexander were apparently the only ones who understood that their dresses were going to be photographed together, and on the red carpet. Sometimes I wonder if the designers are even listening when a challenge is explained. The winning looks were very different but both were beautiful, flattering, and looked expensive. Worst garments: Whoa there was a lot of ugly this week. I disliked pretty much everything except Asha and Alexander's dresses. I'm starting to question the taste level of almost all of these designers. I know that compromises must be made when you're working on a team...but I don't think that excuse forgives them here. Sam's fabric choice was weird. Kini's model looked like a fish from the 80s (I think Kini is taking his Hawaiian theme too far these days). Mitchell, Daniel and Stella were all designing for an adult fantasy store (the still photo of Stella's dress is horrifying). What is happening?? Mitchell's sketch was absolutely gorgeous (the one they have online is NOT the same as the one that was shown on air), but the dress he made looked like it had been eaten by a dog. Next week: Unconventional challenge, blah. Last year when I was pregnant with baby H, I spent most of my time sewing maternity clothes (have you seen the cost of a maternity tshirt?). It got pretty boring. I hated spending time on things with such a short lifespan. 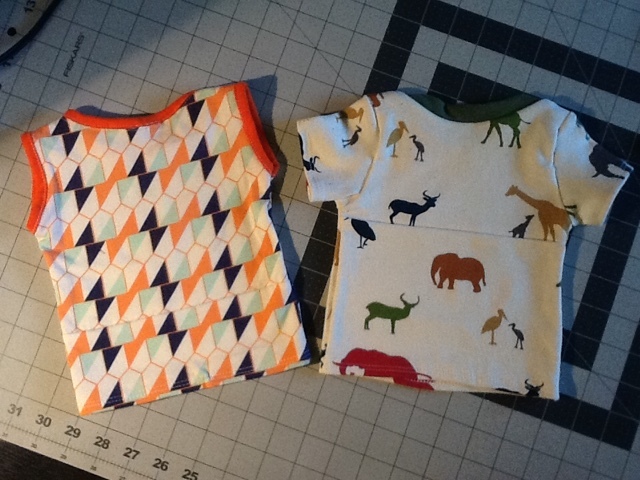 So for this pregnancy, I'm sewing baby clothes, which...also have a short lifespan! Especially since this is (ohpleaseGod) my last baby. 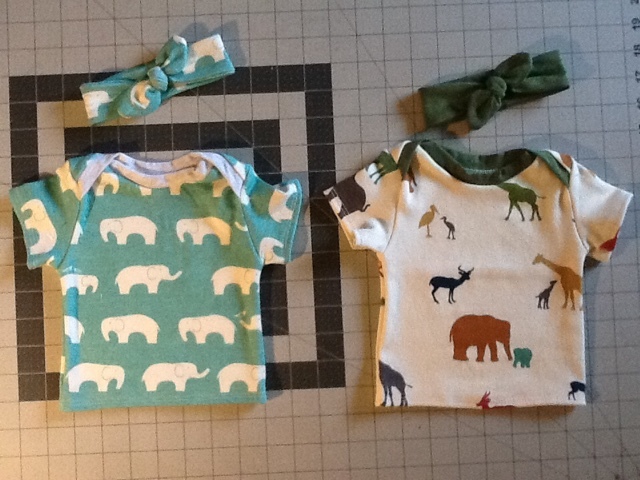 But c'mon, cute cuddly tiny clothes? Way more fun! 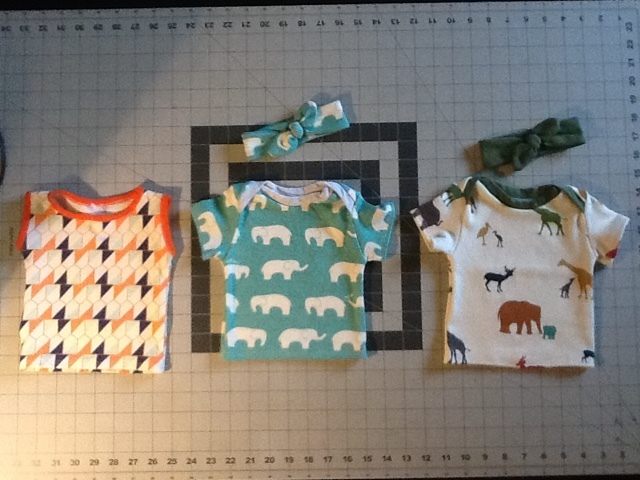 Pro tip: if you're going to sew for baby, do it in the second trimester. This is the "golden age" of pregnancy (if there is one) when you're not barfing all the time and not too big to sit at a table and sew. I've had tons of fun picking fabrics and patterns and making a mini wardrobe for baby #3 whose gender will remain a surprise; not just to you, but to me as well. Here are all the fabrics I selected. I realize the sheep don't really "go" with the others but they were too cute to pass up (more on wool later). These are primarily Birch interlocks ordered from AACottonCreations on Etsy, though there is some cotton/spandex thrown in as well. As you can see, I'm going with a green/orange/navy/teal color scheme, which sounds kind of crazy but I think it works. 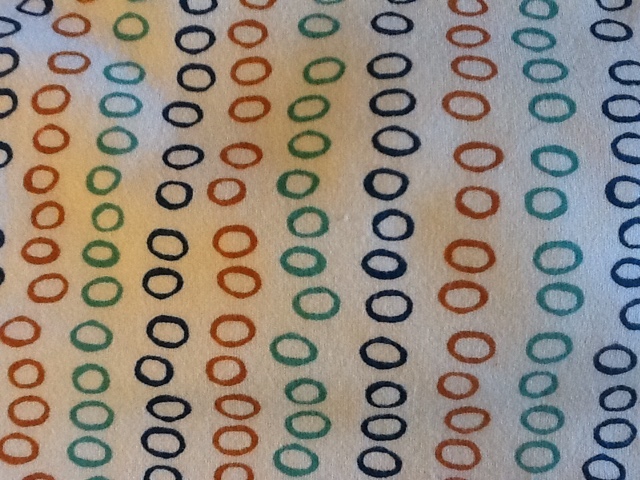 My inspiration fabric was this "bubble rings" knit. It might be hard to tell, but the darkest color is navy. These interlocks can be pricey, especially when you consider that they're only 44"/45" wide (whyyyyyyyy?!). I decided to order half yards to keep my costs low, after calculating that I could make a short-sleeved 3 month sized top with that much yardage if it didn't shrink too much. For reference, they shrunk about 1-2". I ordered a full yard of the bubble rings because I liked it so much! I made primarily tops, not onesies or rompers. 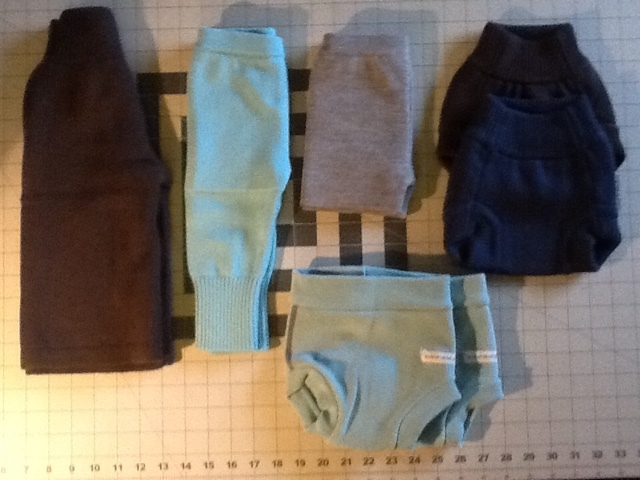 I plan to continue with cloth diapers, and my newest obsession, wool covers/pants. 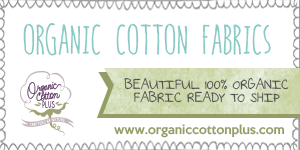 Wool used for diapering is expensive but high quality (and doubles as pants/bloomers), so you have to choose your colors carefully since you don't have tons of them. I made sure to sew tops that would work with most of my wool pieces. I plan on adding a green piece and also one in an orangey tone like the color on the bubble rings knit. These three tops were the quickest and easiest. The tank top (I'm due in July) was made from the Peek-a-Boo Patterns Summer PJs pattern. It's a 3 month size, but since this pattern is PJs it runs very small/close-fitting and will probably fit a newborn (well, one of my newborns anyway, who have consistently been in the mid-8lb range). The primary fabric is here. The orange trim was in my stash, a cotton/spandex from Girl Charlee I believe. I did alter the pattern to bind the neckline and armholes instead of using a band. The two tees were made from the Lullaby Line Lap Tee/Bodysuit, also from PABP and also in a 3 month size. 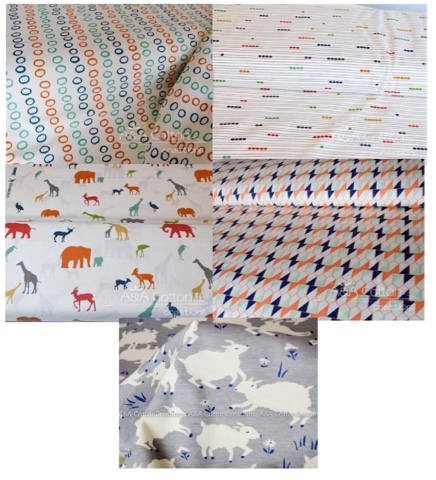 The elephants were leftover from my review with Organic Cotton Plus, and the safari animals on cream are here. Again, trims were from my stash. 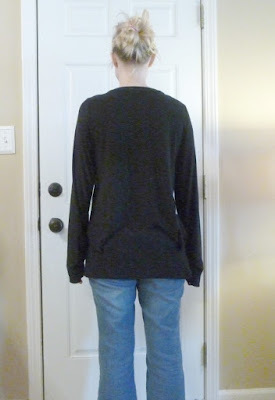 A lap tee is a lot easier than you think, and Amy's patterns (plus a serger and coverstitch!) make quick work. I noticed that my choices were starting to skew a bit boyish, so to remedy that situation I whipped up some matching headbands, in case I have another girl. 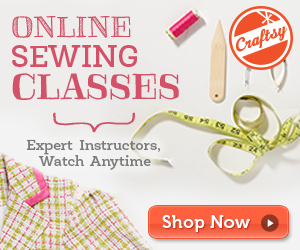 I found a free pattern/tutorial on Pinterest (there are a gazillion, find my faves on this board). These were also really easy as long as I remembered to size up (giant baby heads!) and to use a zig-zag stitch, since I couldn't use my serger around those tiny curves. To make the most of my limited yardage, I did have to piece together the backs of two of these tops. 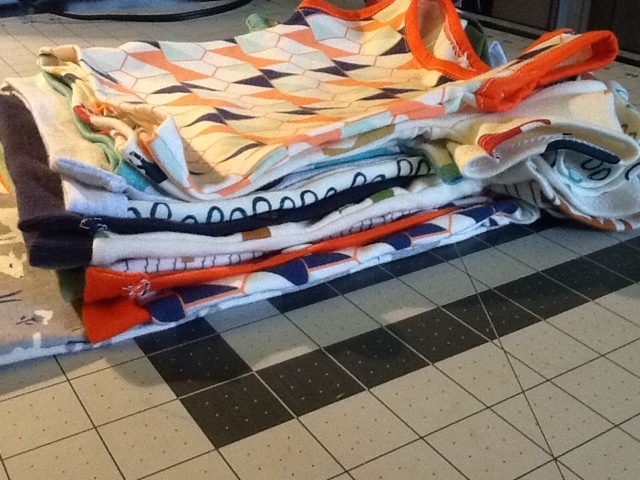 I also plan to use all my scraps and appliqué them onto solid colored RTW onesies. The local kid's resale shop sells onesies 10 for $10, so for not much money I can practically double my newbie's wardrobe of customized clothing. Did I mention I sold/donated all my newborn clothes from my previous two kids? Whoops. These are just a few of the items I've made so far! I did have to stop and take a break when my 4 year old told me I was making too many baby clothes, so I spread the love around and made my other kids some things too. I'm enjoying this hiatus from fitting myself and making preggo clothes for me. It's more enjoyable making kid's clothing when I have more than one child, since I know the bigger things will be passed down even if they're outgrown quickly. I watched this week's episode without my 4 year old, so unfortunately I have no silly impersonations to report. Unless you count Baby H (9 months old) walking as awkwardly as the models on the "windway". Best moment: I think a "windway" was a good idea but it didn't end up as cool as the rainway. Worst moment: So. Much. Chiffon. I wish there had been more variety in the designs. Everybody went the same direction. Or rather, the same two directions, either a cape or a feature I like to call "wrap fabric around it". Best looks: Sam's and Kini's were my two favorites. Kini's, however, was only successful on the bottom half. I agreed with the judges, the belt was weird (when was the last time you saw any black in a sunset?). The lace looked like it belonged on a different dress. Sam's whole story about the woman in a convertible worked, and I think it was Issac who said that it was the only garment that looked good standing still. I think he deserved the win. Worst looks: I was very surprised by the looks that were in the bottom. I mean, it's kind of telegraphed because of who the show focuses on leading up to the runway, but still. Mitchell's was way ugly and weird (what was with the loops?). When Ken's dress came out my immediate reaction was to think how restricted the poor girl looked. Alexander's cape was awesome, but what was underneath was so disappointing. Valerie was in the top but I agreed with whoever it was that said it looked like a prom dress (probably had a lot to do with the styling). Daniel: "Are you done Kini?" Kini: "Um...no. I just have to dye it." Daniel: "Dye it? Dye it!?" Overall, I was disappointed with this runway show. I didn't see much deep-thinking in the designs, it was all chiffon and gowns. The models looked uncomfortable. Good idea that didn't work out. Fade's design wasn't the worst but his looks are weird and he's never going to win, so why not say goodbye now, right? I'm glad Sam won but I hope he can tone down his arrogance a notch. Next week: Probably an unconventional challenge and a good opportunity to eliminate Mitchell. A few weeks ago I posted my first Isabelle Top, made from a delicious modal jersey. I hope you can tell from the photo that this knit is slinky and very drapey. 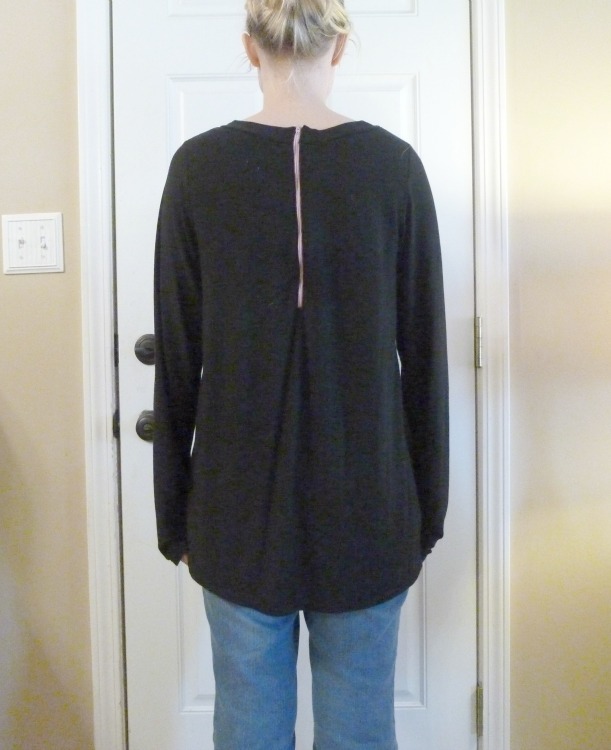 Right after I made this one, I made a second in a plain cotton jersey (from Girl Charlee a long time ago). Like most all-cotton knits, the fabric doesn't have as much drape as a modal (a type of rayon) knit. I think it's helpful to see different reviews of the same pattern, and in this case you can see the exact same size on the same person, but in two fabrics. 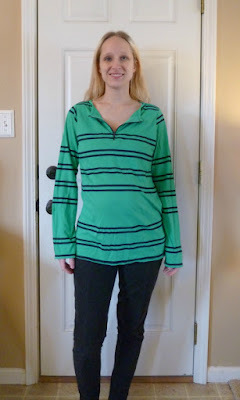 The green top has a shorter zipper and shorter sleeves (no ruching). I experimented with the zipper facing and am happy with the results, the facing is visible now instead of the zipper tape. Other than these changes the two tops are "the same". of kids go up, the amount of giving-a-crap goes down. What a difference a fabric can make! 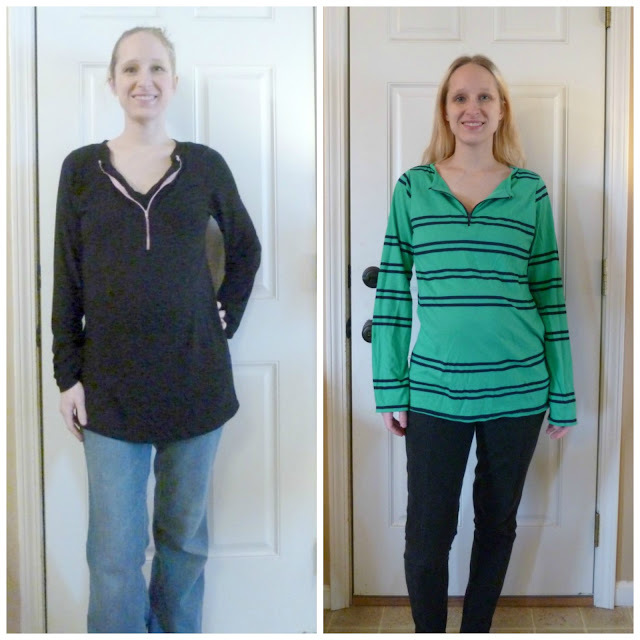 The modal knit shirt can easily be worn either way and stretches enough to accommodate my belly. The cotton jersey is more restrictive and holds its shape. It also supports the zipper much better. The pattern designer recommends a slinky knit for this design. I would agree that the modal knit top is more successful. 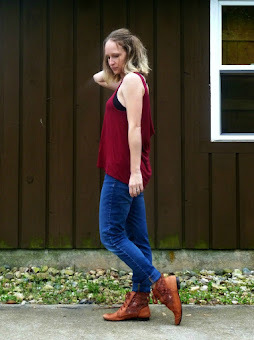 Remember my whiny, I-don't-have-time-to-sew post from a few weeks back? I wasn't being entirely forthcoming. Yes, two kids are keeping me twice as busy as one, and that's definitely cutting into any "me" time. But there's more to the story. I'm embarrassed to say that I bought this pattern when I was pregnant last year, and never made it. Since I got a second chance I thought I'd better use it! This is the Isabelle Nursing and Maternity Top from LouLouJames Creative on Etsy. The pattern is truly genius, because you can wear it front or backwards! One side has a zipper and modesty panel for nursing. 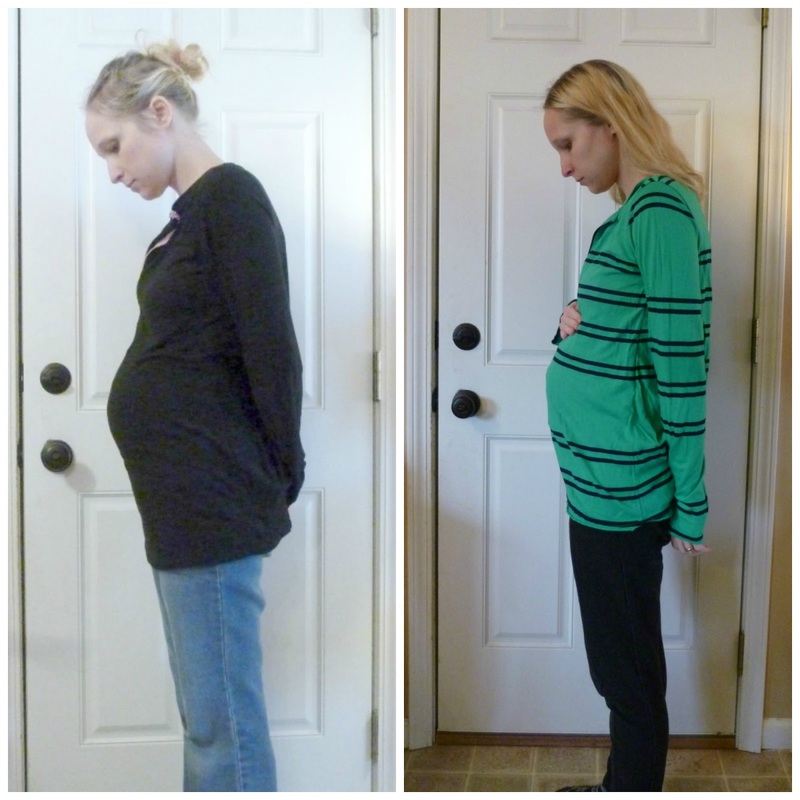 The other side has pleats to accommodate a pregnant belly. Since I'm nursing and pregnant, well, I can wear it either way! 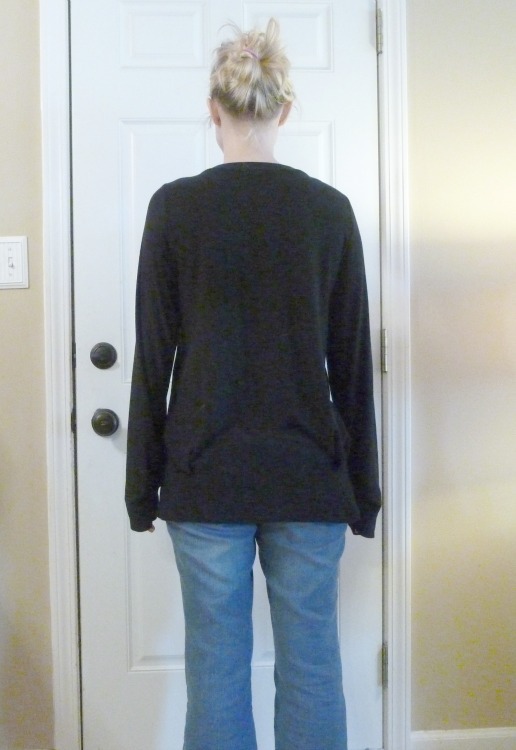 The fabric I used is a black modal jersey, and it's yummy. I believe it's from Mood. I had two yards I was hoarding and it turned out to be perfect for this pattern. This is a lesser-known pattern designer so I do want to give a good review of the pattern itself. I had no issues printing and assembling or cutting. The sizing is generous because that's just the design. It's possible I could go down a size but it would lose the slouchy look. The instructions were excellent and all the notches matched up. I believe there is one omission in that the neckline binding is never sewn closed at the short ends. I just did that, RST, then turned the binding back out and sewed it to the neckline as instructed. If you're using a serger, I recommend basting the modesty panel shoulder seams to the front bodice shoulder seams before sewing to the back. 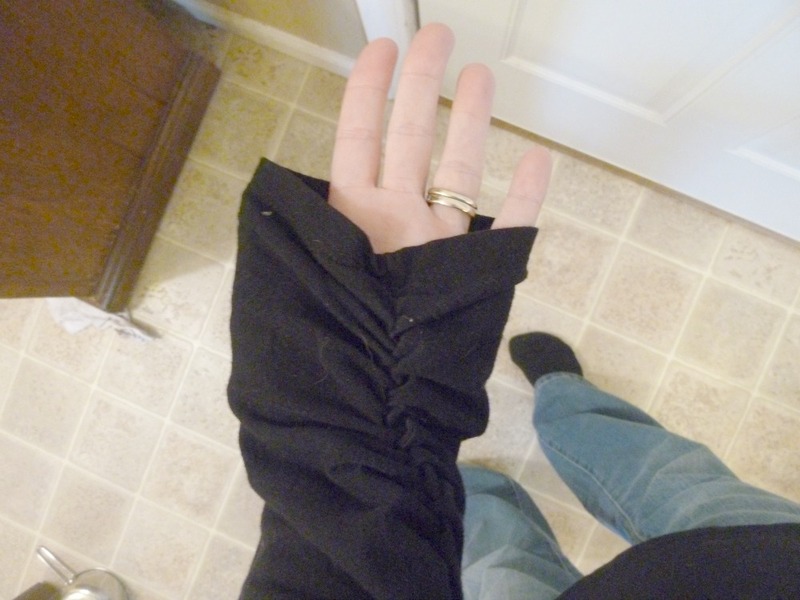 The instructions have you do it separately, which doesn't really work once the shoulder seams are already serged. The only complaint I have is about the zipper insertion. I don't like how the facing doesn't cover the zipper tape. In other words, when it's unzipped and flops open, you see the zipper tape. I'd rather that was covered. I puzzled over how it could be done and also studied some RTW tops. I'm sure the way this pattern is constructed is the easiest method, just not the most finished. Sometimes you have to choose one or the other. One other thing to look out for is the sleeve length. These are cut loooooong and then ruched on one side only. Meaning the un-ruched side is still looooooong. You may want to take some measurements and shorten the sleeve before sewing, or be prepared to cut off at the end. It took forever to sew this top, back in November when I was really struggling to just exist (by the way, I do not recommend back to back pregnancies unless you have a live-in nanny or something). But somehow not dying of exhaustion can probably whip one of these up in a day or two. I also have the Jenna Nursing Top/Dress pattern from LouLouJames so I'm sure you'll be seeing that one pop up sometime. It's much more practical to sew nursing tops than maternity, but they rarely get any attention. So now you know my big secret and the real reason why it's been quiet around here! 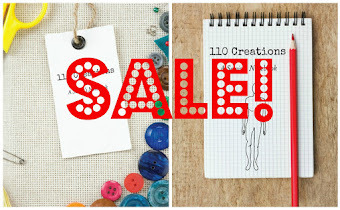 Hope you're ready for some itty bitty baby sewing, because that's in full swing!